Over the last couple of years, crypto trading became very popular among the huge amount of people. Many were successful, but much more of them were not. So, if you are new to automated trading (or trading in general), it might be useful to learn from the mistakes of more experienced traders. 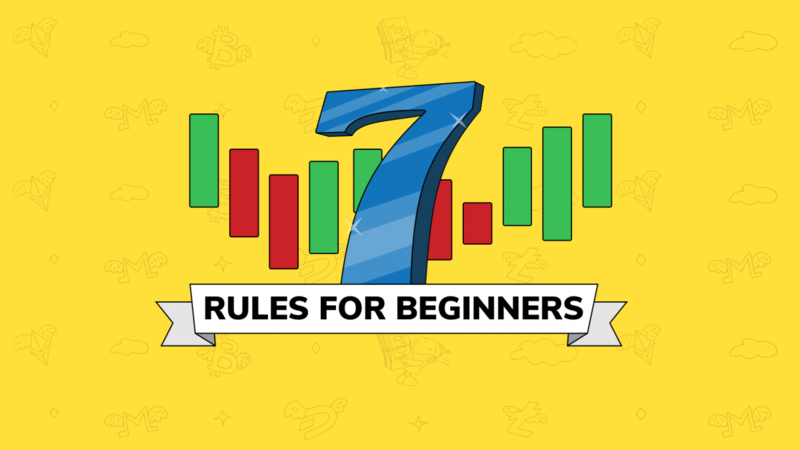 Here are the 7 trading rules for beginners. Crypto market is incredibly volatile and you should always stay informed about the current situation. As a result, you will be able to react right away to any changes, whether you need to take profit, buy more coins or anything else. It is worth noting that automated trading can help you here, because with bots there’s no need to monitor the market 24/7. Emotions will harm your trading. Simple as that. Greed can turn your profit into a loss, if you wait for a bigger profit instead of taking it now. Panic selling of your mid- or long-term investments can leave you without major gains in the end. And don’t forget about excitement, when you see a certain coin pumping like crazy and think that you definitely should buy it right now. Most likely, the result will be quite disappointing. These were just the most obvious examples, but they demonstrate the importance of keeping your head cool very well. Crypto market differs from the traditional one, but main principles are pretty much the same. And technical analysis works here as well. That’s why it can be a good idea to find some time and read about candlesticks, supports, resistances, Bollinger bands, moving averages, etc. You don’t have to be a professional trader, but knowing these things and using them correctly will improve your gains or at least reduce your losses. There is a saying: “Don’t put all your eggs in one basket”. In the context of trading it means that you should not invest all of your money into one coin. There are 2 main reasons for it. The first one is that this rule will greatly reduce the risk of losing all of your investments at once. Because there is always a chance that price of any crypto currency will fall down rapidly. The second reason: if the market grows you can potentially earn more, as the prices of various coins grow differently. Some of them add just a few percent and the other ones have two-digit gains, so it’s always better to have multiple options. Similarly to investing your money into various coins, it would be a wise decision to trade on several exchanges. Firstly, you will have more options for trading, as different exchanges have different altcoins listed on them. Secondly, you’ll have a better protection against hackers or scams. There are plenty of crypto exchanges at the moment, each has its own advantages and disadvantages, so take some time and do at least a brief research on them. Criteria like popularity, trading volume, security, number of traded altcoins, fees and user interface are the most important when choosing an exchange (or exchanges). This tip is probably one of the most important. Trading (and crypto trading especially) is a very risky business and it’s pretty likely that you will lose your money. And it would be better to put at risk only the amount of money you can afford to lose. Otherwise, your financial situation will be much worse. In addition to that, you’ll be less pressured by the fear of losing everything, which makes it easier for you to remain calm and not make stupid mistakes. Crypto industry is rather uncontrolled at the moment and there is a long list of dangers for your money. That’s why security of your funds must be a top priority. Always use strong passwords and two-factor authentication for your exchange accounts, consider using hardware wallets for your crypto. And of course, never share your passwords or private keys with anyone. This list of rules can be extended much further but these 7 are the most crucial in our opinion. Following them should make your start in crypto trading less complicated and troublesome.